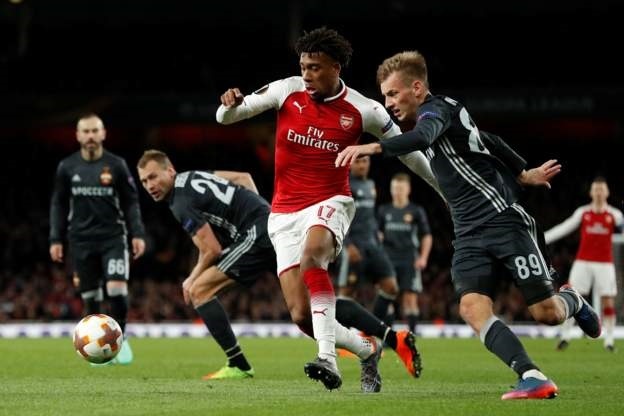 Alex Iwobi had the last laugh in the battle of two Nigerians in the Europa League on Thursday as his compatriot, Ahmed Musa ended in the losing side. Aaron Ramsey and Alexandre Lacazette both bagged braces as Arsenal beat CSKA Moscow 4-1 in the first leg of their quarter-final clash at the Emirates Stadium. Though Ramsey and Lacazette were the goal scorers, Mesut Ozil was the unsung hero as he played a crucial part in all four goals to help hand the Gunners a commanding lead going into the second leg. CSKA find themselves in the midst of a troubling run against English sides, having lost six on the bounce against teams from English shores. Ahmed Musa and his teammates now head back to Russia with merely faint hopes of reaching the last four.